To feel silky smooth skin. Flexible comfort guard, soft skin protection fins. 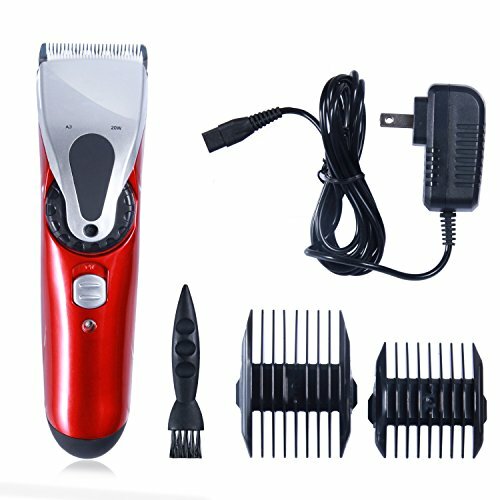 6 layers design captures and cut hairs easily. Suitable for various brand of Beard Shaver. Stainless steel material, very durable for use. 1 machine and 4 blades combo in one set, so you can replace your old or broken one. Keep your beard, mustache, or neckline neatly trimmed and your counters and shirt clean with a Ystar Beard Bib Apron and Shaping Tool combo! Facial hair is what makes a man distinct. Be it a full beard, a kept goatee, or that rugged 5 o’clock shadow, it’s all about looking the part. But it’s almost impossible to keep your shirt, your counter, or your sink clean when you’re trying to shave, trim, or clean up your face. That’s why we developed the Ystar Beard Bib Apron and Shaping Template Tool combo, a smarter way to cover your clothing and the counters below without making a mess or staining your favorite shirt-and getting a perfectly symmetrical shave every time. The best grooming guide no matter what your personal style or look, make sure you always look your best when you take on the day by lining up your facial hair quickly and easily with the Ystar Beard Bib and Grooming Template; a proper way to groom and keep everything a bit cleaner. 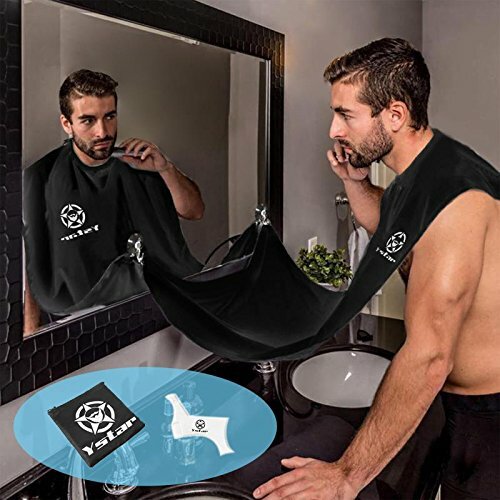 Click ‘Add to Cart’ above to get a premier beard bib hair catcher and beard template shaving tool to keep your facial hair lined up and your bathroom clean! 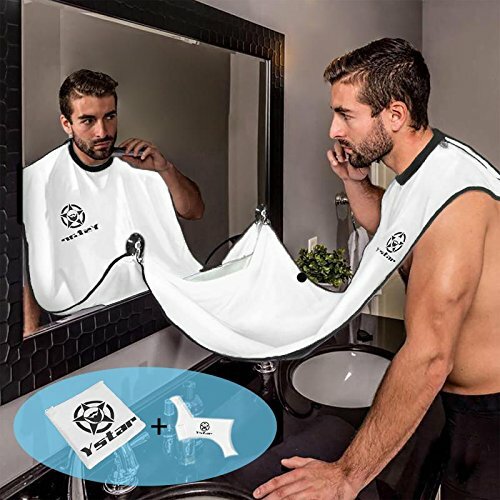 Catch-All Beard Bib – This waterproof men’s bathroom apron catches loose hairs and clippings before they fall on your shirt, the counter, or in your sink drain. Comfortable, Adjustable Design – The Velcro neckline and dual mirror suction cup hooks let you find proper placement, allowing for easier, cleaner use for every beard. Portable, Waterproof Design – Each beard bib apron is designed with a self-packing pouch, allowing you to easily wash it and then keep it in a backpack or travel bag. 8-in-1 Multi-Shaping Tool – This grooming guide features a forehead line, step, straight, and curve cut, mini comb, neck line, mustache, and inward curve goatee. Home & Travel Use – These grooming accessories for the modern man can be used in your bathroom, at the gym, or keep them in a travel bag for use on business trips. 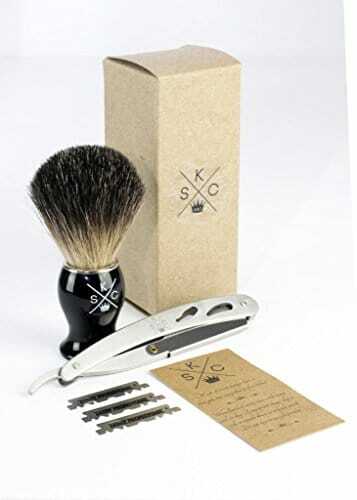 100% Badger Shave Brush, Stainless Steel Straight Razor Shaving Combo. Designed for your Best Wet Shave. Our journey to find the best men’s wet shaving products on the planet has led us to these luxurious KINGSMEN products. When you use something every day of your life, it’s important to get the best possible experience. KINGSMEN takes pride in the crafting of our products. All of our products are made with high quality materials. The KINGSMEN shaving line delivers a luxurious shave every single time. What are the Benefits of Using the Kingsmen Shaving Products? This 100% pure badger hair shaving brush delivers a luxurious shave every single time. Groom Like a Gentleman Every Morning! The soft and opulent badger hair bristles feel magnificent on your face, and they easily whip up a thick, creamy lather quickly, giving your best shave each and every day. 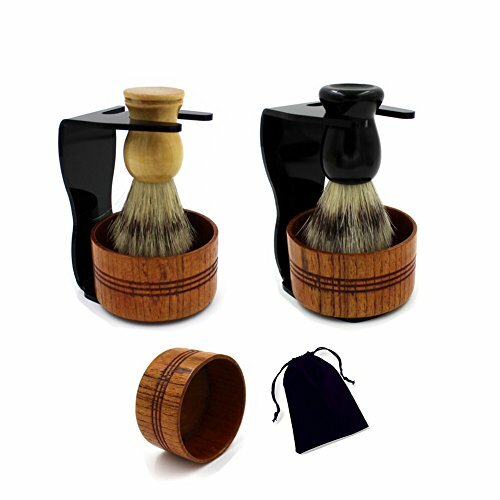 Kingsmen Badger Hair Shaving Brush – Why Use One? Once you dip your brush in hot water and mix with shaving soap, an interesting thing happens. The badger hair brush whips the shaving soap and water to create a thick lather that not only covers your face, but exfoliates and removes dead skin. The badger hair lifts your facial hair and suspends it in the thick lather giving you the closest shave of your life. The suspended hair is sliced by your razor at a closer distance than would be without using a brush. This badger hair brush will increase the amount of lather you produce and give you a close, smooth shave. Made from genuine surgical grade stainless steel! These beautifully designed razors allow you to easily change a blade between shaves. Rounded exposure at the end of the blade compartment helps to minimize cuts. Unlike traditional straight razors, no sharpening or stropping is required. Includes 3 Derby razor blades. This Hair Clippers Kit keeps you always looking good, it’s very useful both in home and profession salon use! High precision and heavy-duty blade Rechargeable electric Trimmer with built-in battery for exceptional flexibility and maneuverability. SHARPER & QUIETER: This haircut kits Titanium blade combining with the ceramic movable blade for efficient and long term cutting and will not get rusty. Relative to the stainless steel blade it is double in hard and sharp. Easily cutting your hair and beard(Aviation restrictions oil not include). ADJUSTABLE CLIPPERS: Adjustable the cordless clippers head from 3-20mm you can get different lengths you want kept. The distance of the comb, you can keep the hair length you want. Even if the non-professional personnel can easily use the trimmer. 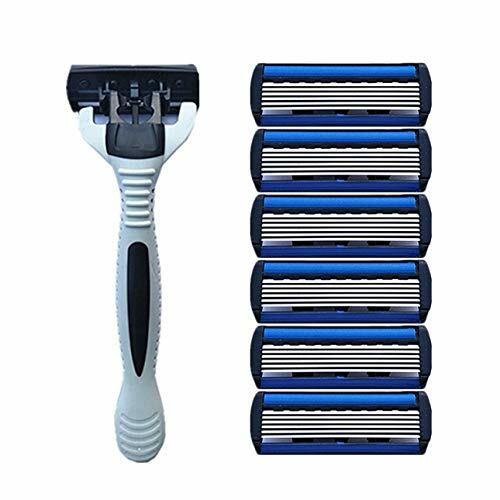 WIRELESS RECHARGEABLE & VERY QUIET: Built-in 1500mAh (1 PCS) rechargeable battery, charging for 3 hours, It can be maintained for 60 minutes shaving needs. The working sound is about 50 decibels. STREAMLINED DESIGN: Body adopts streamlined design Coupled with Silicone Textured matte feel of the handle. You will no longer be tired of shaving, but a pleasure. ATTACHMENT: With 2 attachment guide combs: thinning-out, (3mm/6mm/9mm/12mm,) skin-friendly contour-following combs make it safe, easy, comfortable. Lucky Tiger brand. For the sophisticated tastes of a gentleman but affordable for all. blades and a stylish rubberized ergonomic handle. –All encased in a retro-new reusable Lucky Tiger tin case. precision while also decreasing nicks, cuts and reduces skin irritation. corrosion for a longer blade life. This allows less clogging of hair follicles and shaving cream. Lucky Tiger Premium Shaving Cream for Men – 5 oz. long lasting shave without razor burn. 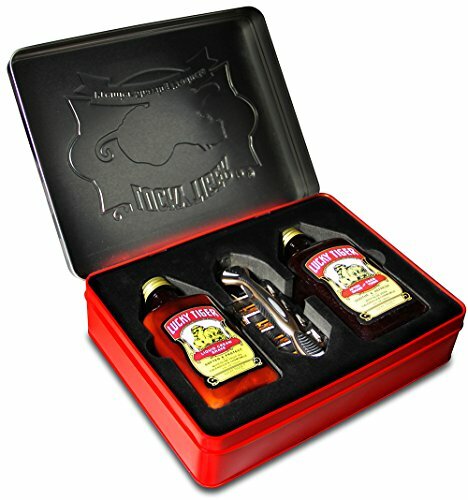 Lucky Tiger Premium After Shave & Face Tonic – 8 oz. and invigorating the skin for a look that is defined, confident and ready for anything. behind our products and will do what is necessary to ensure your satisfaction. 7 Blade Shaving System with tilting head, lubrication strip, comb bar to prep hair, Venetian Flow blades, and a stylish rubberized ergonomic handle (8 total cartridges). Liquid Cream Shave (5 oz) developed to prep, lubricate, cool and hydrate your skin for a perfect long lasting shave without razor burn. After Shave & Face Tonic (8 oz) completes the cleansing and shaving process while soothing, toning and invigorating the skin for a look that is defined, confident and ready for anything. From Wahl Professional’s commercial grade line of products, the All Star Combo is intended for professional use and is designed to deliver the sharp performance that experts demand. The Wahl Professional All Star Combo combines two great haircare products in one package. 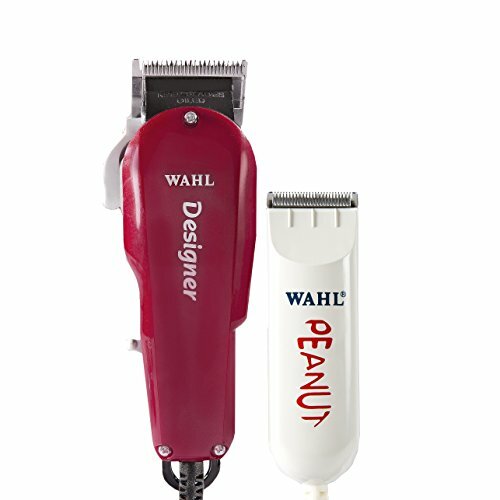 The Wahl Designer Clipper and Wahl Peanut Trimmer are both lightweight, ergonomically designed, and powered by electromagnetic motors, making them capable of fading, blending, edging, and more! 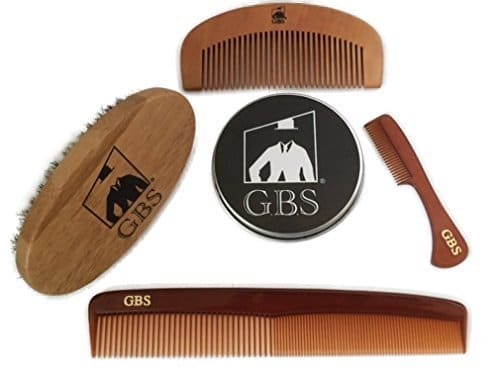 They’re the perfect choice for barbers, stylists, and artists, and are sure to be staples in your shop. For your convenience, the All Star Combo (#8331) comes with all accessories required for use. It includes 6 clipper attachment combs for the Designer Clipper, 4 peanut attachment combs, oil, cleaning brush, instructions, operating instructions and red blade guards. The Wahl Designer Clipper measures 6.25” long, weighs 1 lb., and features a 1005 blade. The Wahl Peanut Trimmer measures only 5” long, weighs 4 oz., and features a 2068-300 blade. The Designer Clipper and the Peanut Trimmer include an 8 and 7 foot professional-grade, chemical resistant power cord. Leo J. Wahl invented the first hand-held electric clipper back in 1919. He believed in necessary, reasonably priced products that enhanced the lives of everyone who used them. Today, all Wahl products embrace the principles of our founder. We offer reliable, value-priced devices and solutions that protect skin and hair while performing on all skin and hair types. This corded clipper is a barbershop must-have. With a powerful electromagnetic motor that cuts twice the speed of pivot motors, it offers barbers and stylists a surgically-close cut, making it perfect for quick, precise, and effortless skin and bald fades. For sale and use in the U.S.A. only. PROFESSIONAL PRECISION: From Wahl Professional’s commercial grade line of products, the All Star Combo is intended for professional use and is designed to deliver the sharp performance that experts demand. STYLISH AND VERSATILE: The Wahl Professional All Star Combo combines two great haircare products in one package. The Wahl Designer Clipper and Wahl Peanut Trimmer are both lightweight, ergonomically designed, and powered by electromagnetic motors, making them capable of fading, blending, edging, and more! They’re the perfect choice for barbers, stylists, and artists, and are sure to be staples in your shop. ACCESSORIES INCLUDED: For your convenience, the All Star Combo (#8331) comes with all accessories required for use. It includes 6 clipper attachment combs for the Designer Clipper, 4 peanut attachment combs, oil, cleaning brush, instructions, operating instructions and red blade guards. 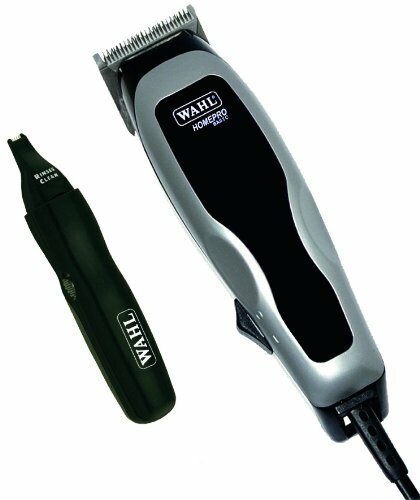 PRODUCT SPECIFICATIONS: The Wahl Designer Clipper measures 6.25″ long, weighs 1 lb., and features a 1005 blade. The Wahl Peanut Trimmer measures only 5″ long, weighs 4 oz., and features a 2068-300 blade. The Designer Clipper and the Peanut Trimmer include an 8 and 7 foot professional-grade, chemical resistant power cord. 100% Satisfaction Money Back Guaranteed. Makes for the perfect gift!! 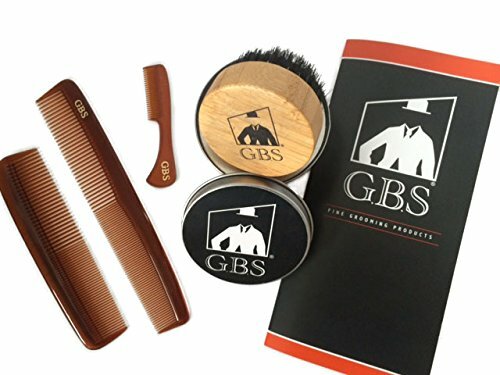 Our beard grooming set comes with everything you need! You’ll love the look and the quality of this set whether you are buying it for you or you’re buying it as a gift for someone. All the accessories you need to get the best and cleanest beard possible. Oval Boar Beard Brush – 4 1/2″ x 2 3/8″. The boar hair bristles, gently massage the skin beneath your beard for stronger, healthier, protected skin. Palm easily grips this military style brush. Large Wood Beard Comb – 2 x 4 3/8 Perfect for combing through beard oil & beard balm. Anti-Static and Detangles your Beard. Great for long beards and won’t bend in your pocket. Round Bamboo Beard Brush – Diameter 2 1/2″ Stylish silver canister makes storage easy and fits great in travel and bags. No-fuss no-mess application. Improve beard health and keep hands clean. Smoothly grooms both dry and wet beards. Gently massage the skin beneath your beard for stronger, healthier, protected skin. Tortoise/Horn Unbreakable Pocket Comb – 5″ coarse/fine toothed comb. Made to avoid pulling, tangling or damaging hair. Size makes them ideal for a back pocket or school backpack. Styling on the go! The Wahl Home pro Basic clipper provides you with quality and simplicity at no added cost making this kit suitable for a beginner. The kit entails 11 pieces including four comb attachments, which fit easily onto the clipper providing you with sufficient grades to provide a creative but achievable look from your home. Cutting length can be adjusted between 1.8 and 12 mm using the comb attachments. This comb kit comes complete with a dual head personal trimmer ideal for removing unwanted hair from ears and nose and for grooming eyebrows. Hygienic blades can be rinsed and cleaned under running water. Includes full instruction booklet to make hair cutting simple at home. Like all Wahl blades, the high quality steel blades are precision ground to offer maximum performance and stay sharper than other blades available, thereby, offering a higher standard of cut and durability. This mains operated clipper is powerful but quiet so it’s enjoyable to use and is suitable for using on younger children. Wahl has provided the Beauty and Barber industry with high-quality clippers and trimmers since 1919, with over 90 years of experience in developing and manufacturing personal grooming equipment. Since 1919, with the first practical electric hair clipper, Wahl Clipper Corporation has been in the professional and home grooming category. They are carrying forward the tradition of offering better customer service that was created by Leo J. Wahl over 90 years ago. Today, their products have become one of the preferred choices of stylists and barbers around the world. 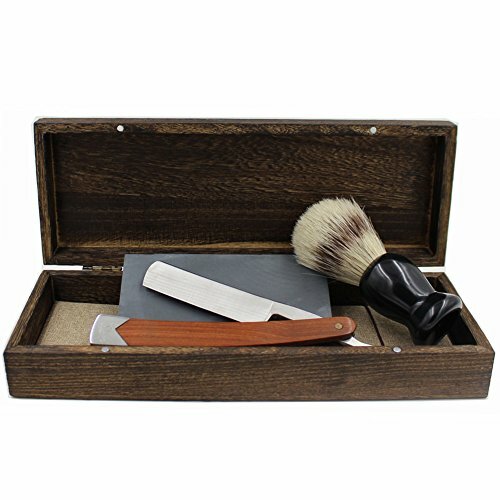 New arrival straight razor set. Solid long wood handle with a comfortable grip. Razor blade is double edge ground. Easy to get sharpen if you think it is not sharp enough. Perfect choice for both beginners and professional users. Phone number is very important. Sometimes parcel might be returned if you left us incorrect phone number. and Free expedited international shipping on orders over 99.00 USD!!! and Free expedited international shipping on orders over 199.99 USD!!! Name and address must wrote in ENGLISH. *Phone number is very important. Please leave us your correct phone number as it is a new requirement from shipping compay. Sometimes parcel might be returned due to incorrect phone number. Package include: 2 acrylic stands, 2 shaving bowls + 2 brushes and 2 black velvet pouches / PS. Please kindly know that shaving razor is displayed for demonstration only. It is Not included.